The Enchanted Floral Garden gives life to hundreds of botanical and tropical plants, cacti, succulents, and insects on a gentle eight acre hill with a fantastic view of the central Valley, south Maui, West Maui Mountains and Pacific Ocean. Located just off Kula Highway at Mile Marker 10, it is an inspiring stop to make on your way up to or down from Haleakala Crater. When embarking on a Road to Hana trip with Valley Isle Excursions, The Enchanted Floral Garden is the last stop to get some refreshing mountain air after a long journey. Depending on the season and amount of rainfall, the Enchanted Floral Garden may surprise you with different flowers blooming, for a distinct experience each time you visit. Strolling along the path of the garden walk, you will see the many unique species planted by the previous owner, Kazuo Takeda, a Japanese pivotal petunia breeder who developed the garden. Takeda first visited the garden as a tourist then bought it in 1989. With his passion for plants, the number of species grew from 400 to over 2000. As soon as you arrive, you enter a small café that offers coffee, smoothies, soups, sandwiches, salads and homemade specialized pastries from local bakers. You can enjoy your goodies at a quiet outdoor resting area looking out into the garden. We were greeted by Roxanne and Jesse, who operate the café and garden, along with their daughter Ella and their friendly Jack Russell. Children can find fairies and wish upon the Wishing Tree. The garden has some interactive play that the children can enjoy during the garden walk. Almost like a scavenger hunt for the children, they will come across cute little doors and houses where the fairies who inhabit the garden live. Be sure to keep quiet and not scare the fairies away! Halfway through the garden, you will come upon an imposing wishing tree with beautiful strips of rainbow-colored ribbons that sway in the breeze. The area is decorated with cacti and air plants surrounding the tree. Encourage your children to write a wish on a ribbon and tie it on the wishing tree. Once the ribbon falls, it is believed that the wish has been granted. The garden has a wonderful range of fruit trees, shrubs, and vines that produce fresh treats. Depending on the season, you might see them bearing fruit, so keep an eye out for guava, lemon, starfruit, grapefruit, pomelo, lilikoi vines (known as passion fruit,) longan berry, and variety of cherries. We also saw plenty of avocado, Maui coffee beans, and cotton among herbs such as rosemary, all spice, and oregano. After the first arch, the Miraculous Berry shrub waits on the left. By rubbing these miracle berries on a lemon, it can turn a sour lemon into a sweet tasting fruit. Please enjoy the view as you walk past, but do not pick any fruits, vegetables, nuts, or flowers. On a lucky day, you may come across a colorful Jackson Chameleon meandering slowly across the path. The males have three thorns and the females have no horns and resemble a miniature triceratops dinosaur. Surprisingly, we came across flowers and plants we have never seen before, such as the purple ginger, the Dutchmans Pipe, and King Protea. Other plants we encountered were the fig tree, Banyan tree, hibiscus, bird of paradise, lotus flower, plumeria, oregano, azaeleus, coral tree, kukui nut tree, kava kava, just to name a few. This ten foot white gazebo is a perfect place to take a rest and lookout towards the beautiful Maui West Mountain and the ocean. They’re also doing the scariest Halloween event on Maui, open for four weekends on October 9-11, 16-18, 23-25, 30-31 from 5-9pm. Recommended for children over 12 years old. Children under 12 must be accompanied by an adult. The Enchanted Floral Garden offers a Chocolate Immersion Workshop for you to learn about cacao trees, experience how to make chocolate, and make an ancient Aztec drink from roasted cacao beans. Call (808) 280-6533 for workshop dates. 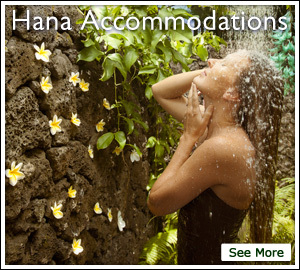 If you are interested in the Road to Hana trip, give Valley Isle Excursions a call at (808) 661-8687‎ and you will have a memorable time driving through the Hawaiian rainforest, at which time you can make your last stop at The Enchanted Floral Garden. The garden’s luscious and vibrant walk can be enjoyed by botanists and horticulture enthusiasts as well as families and children. A huge mahalo to our guides Roxanne, Jesse, and Ella for showing us their backyard.